Article from the Syracuse Journal, May 2, 1913, one of the many newspapers which carried the Devil’s Footprints story. Where are the Devil’s Footprints? 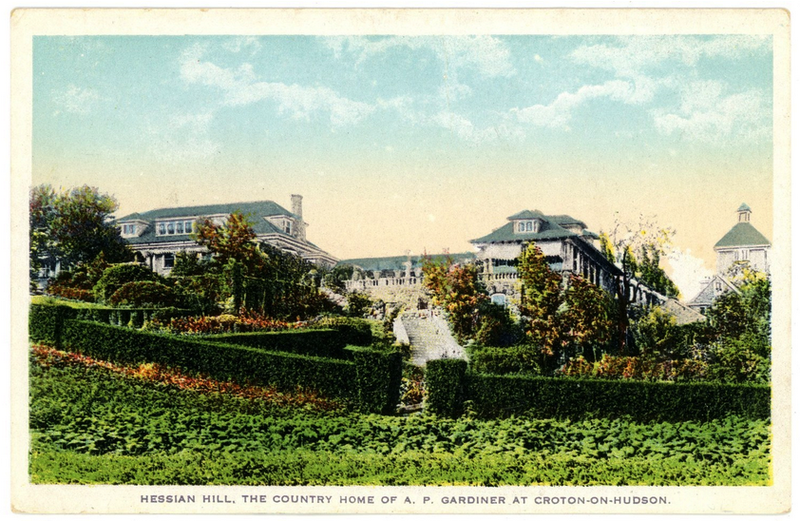 This simple question was recently posed to a group of Crotonites—experts in local history, in Hudson Valley geology, and some people who grew up here and explored all of Croton’s old ruins and haunted places in their youth. district north of New York City . . . by E. Belcher Hyde, 1908. Plate 12. Click the image to enlarge it. 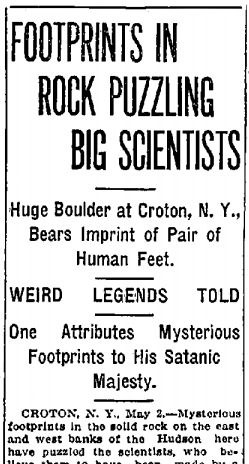 “Mysterious footprints in the solid rock on the east and west banks of the Hudson at Croton have puzzled the scientists, who believe them to have been made by a primeval man before the Stone Age. 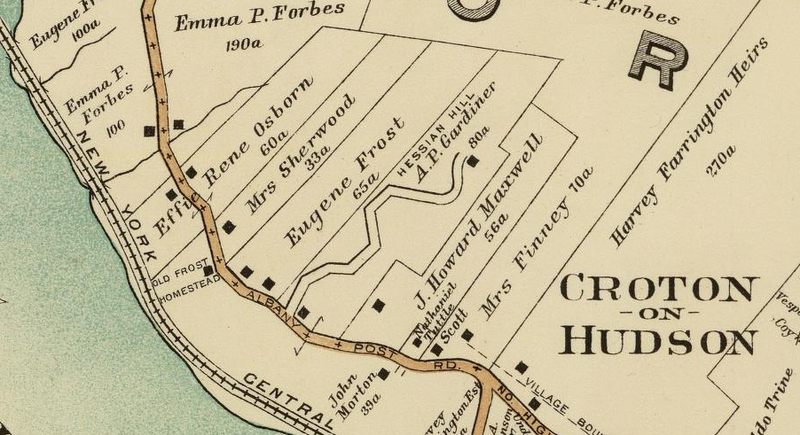 On the east shore, along the old Albany postroad (sic) and at the bottom of a steep hill belonging to the A. P. Gardiner estate, lies a huge boulder shadowed by tall trees . . . Its smooth surface bears the imprint of a pair of human feet placed side by side, as if a barefooted man had walked down the hill and stood on the spot while the stone was still soft and yielding from nature’s crucible. Every toe is clearly defined, and judging from the mold he left in the granite the foot of this ancient man was both large and shapely. Behind the footprints, all the way to the top of the rock, are a series of peculiar indentations such as the links of a heavy chain would make in soft earth. Exactly opposite, on High Tor Mountain, on the other side of the Hudson, the footprints again appear on the rock, but with the heels turned toward the river, as if the man was traveling away from it due west. 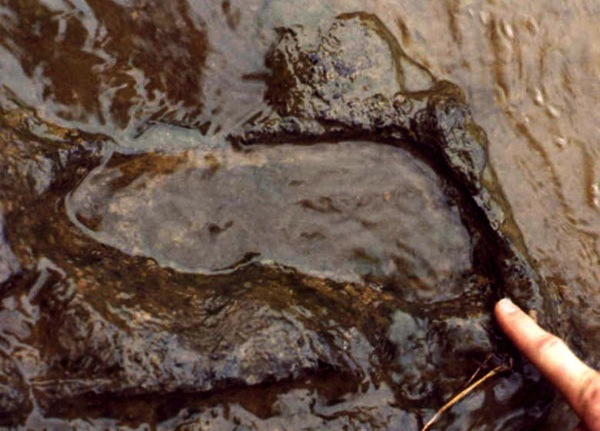 By actual measurement the footprints on both sides of the river correspond in every particular and were undoubtedly made by the same pair of feet. 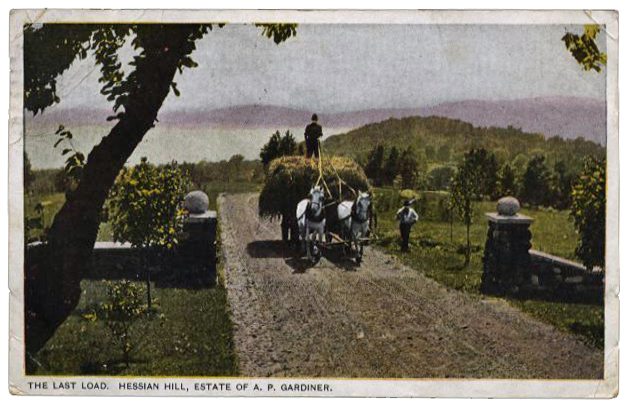 Today, only the foundations of Gardiner’s home are left at the top of Hessian Hill. Click the image to enlarge it. Many weird and wonderful legends have been read from the footprints in the rock. One of these attributes them to the devil, who was chained up in Connecticut for a number of years, but finally escaped and fled into New York. Dragging his chain after him, he paused on the boulder at the foot of Hessian Hill to rest before he continued his flight to the vast Adirondack wilderness. The indentations in the Hessian Hill rock are pointed out as the marks of his chain, and the footprints on High Tor as further corroborative evidence of the truth of this tale. Another story relates that a cave man was approached from the rear by a terrible many-legged serpent as he stood upon the boulder, and that he was so frightened he leaped clear across the Hudson and landed on the other side. The indentations are supposed to have been made by the serpents’ legs . . . 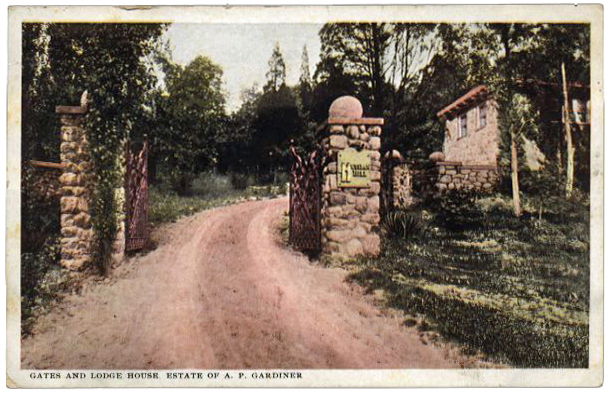 The building on the right is a private home today and the entrance gate columns are still there. The view of the Hudson from the top of the hill. The Devil’s Footprint in a rock on the bank of the Green River Cove near Hendersonville, North Carolina. Someplace at the bottom of Hessian Hill “lies a huge boulder shadowed by tall trees” with “a smooth surface,” bearing “the imprint of a pair of human feet placed side by side.” They aren’t the footprints of a leaping Devil, they’re a natural phenomena—but one so seemingly real that they became a local legend more than a century ago. Unfortunately, it appears that this particular legend wasn’t passed on from A. P. Gardiner’s era to today, so we’re left with a question that we hope some Crotonite can answer. . . . Where are the Devil’s Footprints? Still one of your best! Thanks! I’m still looking for them! https://www.google.com/maps/@41.2159114,-73.9022889,96a,20y,16.04t/data=!3m1!1e3 ? If you look in the middle of the trees it looks like two footprints. I suppose you would have to look closely to verify. This is 12 prickly pear hill rd. Anyone know Gem Mitchell or Mitchell Bring to ask?